The U.S. Navy’s MQ-4C Triton program expects to deliver the first baseline configuration aircraft to the service later this year, with an upgraded version capable of collecting signals intelligence (SIGINT) due to follow in 2021 to succeed the Lockheed EP-3E Aries. It has postponed adding a “sense-and-avoid” radar to the unmanned aircraft until an incremental upgrade planned in 2024. The program plans to complete testing an integrated functional capability (IFC) 3 configuration Triton by August, fulfilling the requirements of its Milestone B approval in 2008—the start of engineering and manufacturing development. Manufacturer Northrop Grumman has built three system development and demonstration models of the RQ-4B Global Hawk derivative, two of which the Navy owns, as well as a fatigue test article. Last September, the Navy awarded Northrop Grumman a $255 million contract to produce three low-rate initial production Lot 1 Tritons. The manufacturer is currently building early operational capability aircraft B-5 and B-6 at its Palmdale, California facility. These will be sent to the Navy’s Point Mugu test range later this year, with final delivery starting in mid-2018. Triton IFC 3 is the version that will enter service with the Navy next year; it comes equipped with the Northrop Grumman AN/ZPY-3 Multi-Function Active Sensor (MFAS) maritime radar, Raytheon MTS-B electro-optical/infrared sensor turret, automatic identification system receiver and electronic support measures. “IFC 3 equals baseline Triton,” said Sean Burke, program manager for persistent maritime unmanned aircraft systems with the Naval Air Systems Command (Navair). “The primary focus now for the program is completing the system development and demonstration contract and handing the system over to the fleet,” he told reporters April 4 at the Navy League Sea-Air-Space conference. Once IFC 3 testing is completed, the program will deliver the aircraft to the Navy’s VX-1 air test and evaluation squadron in September, Burke explained. 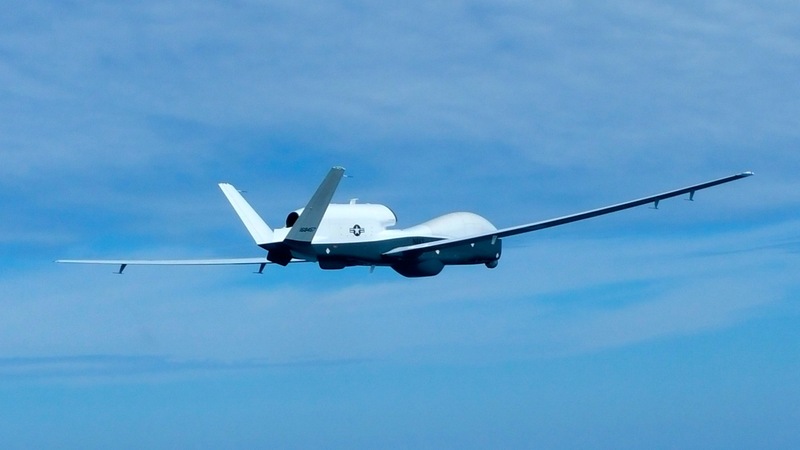 The test squadron will conduct a two-month operational evaluation involving air crew and maintainers from Unmanned Patrol Squadron (VUP) 19 at Naval Air Station Jacksonville, Florida, the Navy’s first Triton squadron. VUP-19 will conduct its own safe-for-flight certification process before beginning operations with the aircraft next year. Recently, the program completed the preliminary design review phase of Triton IFC 4, a “multi-int” upgrade that includes SIGINT functionality. Congress specified in the 2011 national defense authorization act that the Navy produce a comparable system to replace the EP-3, a SIGINT-capable, multi-intelligence platform based on the P-3 Orion maritime patrol aircraft. Working with Navair’s PMA-290 maritime surveillance program office, the Triton program is incorporating a SIGINT sensor payload with components from Boeing Argon ST and Sierra Nevada Corporation. Plans call for delivering the IFC 4 version in 2021 to coincide with the Navy’s retirement of the EP-3. The baseline Triton was supposed to have a sense-and-avoid radar subsystem that would help prevent midair collisions with other aircraft. But the program encountered technical problems that led the Navy to order work stopped on the radar development in 2013. The effort has since resumed with Northrop Grumman as lead system developer, but the plan for introducing an SAA radar has moved to a planned IFC 5 upgrade in 2024. “The technology continues to evolve,” Burke said. “There’re two elements to it—one is the ability to execute IFC 4’s development and deliver it [to the Navy]. We can only pack so much content, if you will, into IFC 4. The sense-and-avoid radar brings in a fairly high degree of test requirements to prove the capability that will then allow for safety and use certifications. When we looked at trying to pack all that into the IFC 4 timeline, it was too much complexity, too much content.